Mr. Becker was sixty-eight years old. 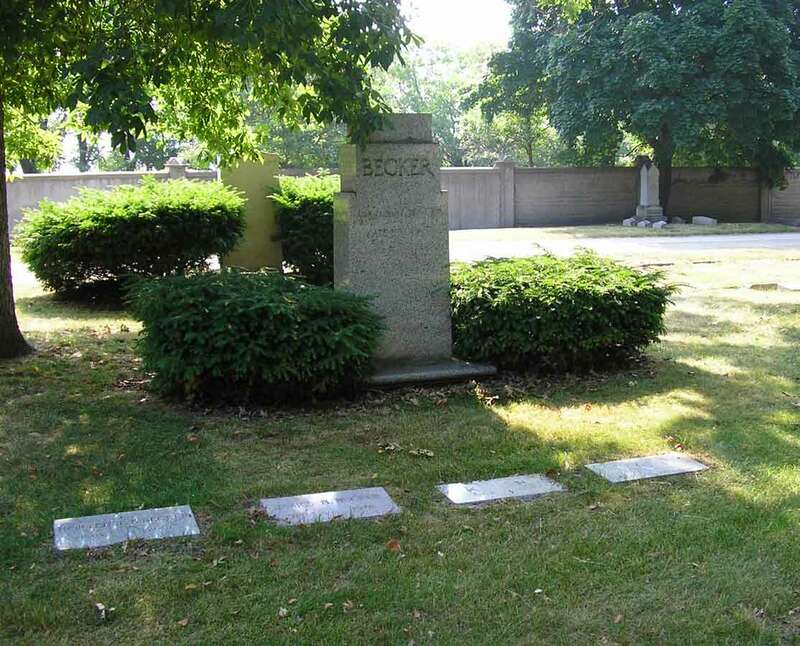 The Tribune went on to report that Mr. Becker’s birth was in Warsaw, Ohio, on September 21, 1867, and his early employment was at the German National Bank in Chicago, followed by many years with Herman Schaffner & Co., and then over thirty years in his own firm. Within a few days of his death, the then prominent Chicago Journal of Commerce published an unusual eulogy. 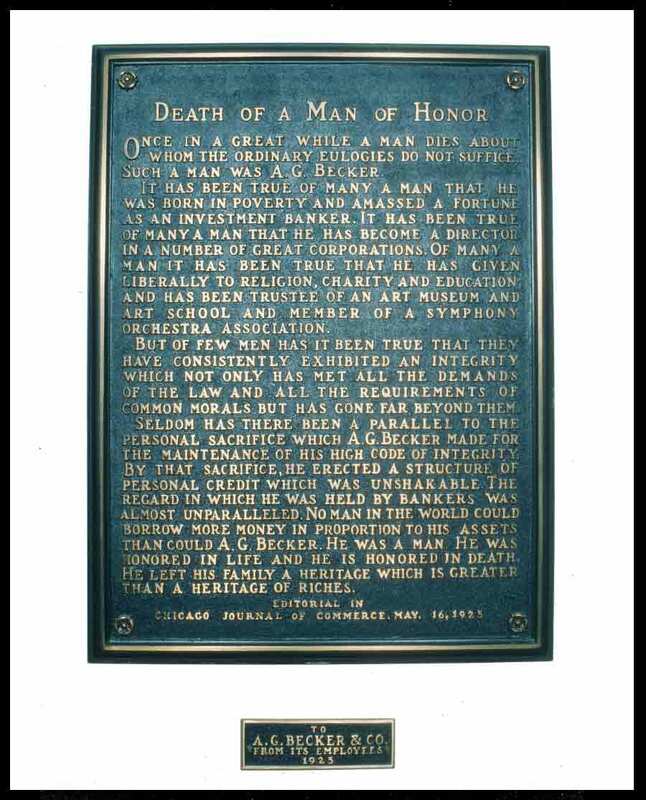 As a matter of corporate policy through the years, this eulogy was displayed in the form of a bronze plaque on the wall of the reception area of every Becker office. The Chicago office plaque is archived with the Newberry Library. ONCE IN A GREAT WHILE A MAN DIES ABOUT WHOM THE ORDINARY EULOGIES DO NOT SUFFICE. SUCH A MAN WAS A. G. BECKER. IT HAS BEEN TRUE OF MANY A MAN THAT HE WAS BORN IN POVERTY AND AMASSED A FORTUNE AS AN INVESTMENT BANKER. IT HAS BEEN TRUE OF MANY A MAN THAT HE HAS BECOME A DIRECTOR IN A NUMBER OF GREAT CORPORATIONS. OF MANY A MAN IT HAS BEEN TRUE THAT HE HAS GIVEN LIBERALLY TO RELIGION, CHARITY AND EDUCATION, AND HAS BEEN TRUSTEE OF AN ART MUSEUM AND ART SCHOOL AND MEMBER OF A SYMPHONY ORCHESTRA ASSOCIATION. BUT OF FEW MEN HAS IT BEEN TRUE THAT THEY HAVE CONSISTENTLY EXHIBITED AN INTEGRITY WHICH NOT ONLY HAS MET ALL THE DEMANDS OF THE LAW AND ALL THE REQUIREMENTS OF COMMON MORALS BUT HAS GONE FAR BEYOND THEM. SELDOM HAS THERE BEEN A PARALLEL TO THE PERSONAL SACRIFICE WHICH A. G. BECKER MADE FOR THE MAINTENANCE OF HIS HIGH CODE OF INTEGRITY. BY THAT SACRIFICE, HE ERECTED A STRUCTURE OF PERSONAL CREDIT WHICH WAS UNSHAKABLE. THE REGARD IN WHICH HE WAS HELD BY BANKERS WAS ALMOST UNPARALLELED. NO MAN IN THE WORLD COULD BORROW MORE MONEY IN PROPORTION TO HIS ASSETS THAN COULD A. G. BECKER. HE WAS A MAN. HE WAS HONORED IN LIFE AND HE IS HONORED IN DEATH. HE LEFT HIS FAMILY A HERITAGE WHICH IS GREATER THAN A HERITAGE OF RICHES. Letters of condolence streamed into the firm, to James the son, and to key associates. Below are just a few quotes as examples of the esteem in which Mr. Becker was held among friends and people with whom he had done business. In the absence of personally knowing the man, these comments will acquaint readers with this unique human being. In an article in the New York Times of May 29, A. G. Becker’s estate was estimated at $3,150,000. Bequests of $50,000 to the Art Institute and $50,000 to Chicago Jewish Charities were noted.